New York : HarperBusiness, c1994. xiv, 322 p. : ill. ; 24 cm. Presenting new insight into such companies as 3M, Walt Disney, and General Electric, a study on what makes companies successful examines their flexibility, ideology, and strong purpose. 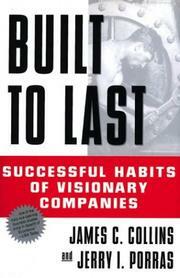 Built to last : successful habits of visionary companies / James C. Collins, Jerry I. Porras. 100 Personl Name ME 1 $a Personal name Collins, James C.
$c Statement of responsibility James C. Collins, Jerry I. Porras. 504 BibliogEtcNote $a Bibliography, etc. note Includes bibliographical references (p. 287-315) and index. 505 ContentsNote 0 $a Formatted contents note The best of the best -- Clock building, not time telling -- -- Interlude: No "Tyranny of the OR" -- More than profits -- Preserve the core/stimulate progress -- Big hairy audacious goals -- Cult-like cultures -- Try a lot of stuff and keep what works -- Home-grown management -- Goodenough never is -- The end of the beginning. 520 Summary Etc. $a Summary, etc. note Presenting new insight into such companies as 3M, Walt Disney, and General Electric, a study on what makes companies successful examines their flexibility, ideology, and strong purpose. 700 AE:PersName 1 $a Name Porras, Jerry I.